Used - Good condition, box has corner whitening. No insert. 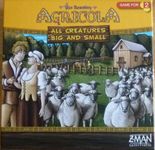 Includes both expansions, Agricola: All Creatures Big and Small – More Buildings Big and Small and Agricola: All Creatures Big and Small – Even More Buildings Big and Small, but only the Even More Buildings Big and Small comes with its box.